Starting from mid-November, NordFX clients enjoy another opportunity for portfolio investments in stocks of major global companies. 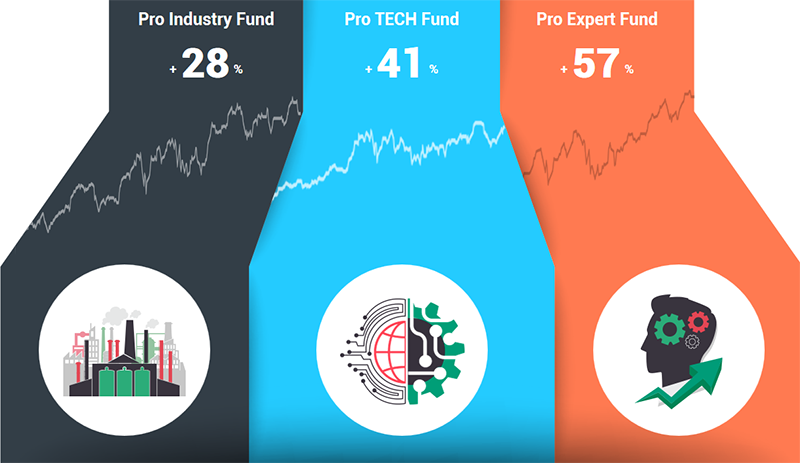 The three investment funds, Pro-Industry Fund, Pro-Tech Fund and Pro-Expert Fund, include stocks with highest reliability and best prospects for growth. The unique advantage of these funds is the low entrance threshold, which allows investors who have even small amounts to enjoy all the benefits of professional asset management. Absolute transparency and freedom of funds disposal give the investor full control over what is going on. The client may deposit and withdraw funds at any time at his request, and the participation of managers allows you to receive the maximum possible profit from this investment. This fund includes shares of such world industrial giants as Motorola, Nike, Ferrari, Boeing, Coca-Cola, HP INC, McDonald's, etc. This fund includes shares of high-tech leaders with best performance in the industry. These are companies such as Apple, Microsoft, Intel, Alibaba, Adobe Systems, Nvidia, etc. Shares of major representatives of various industries, with greatest reliability and potential for growth are collected in this fund. These are shares of Amazon, Netflix, MasterCard, Visa, Google, Facebook, PayPal, etc. In addition to investing in the funds mentioned above, at the request of the client, NordFX specialists can make an individual portfolio for the client or purchase shares of individual listed companies. More information about the investment offers of NordFX can be found at https://nordfx.com/funds/ or by contacting the company's Support Service.